This lovely 3 bedroom, 3 bathroom home is located on the golf course in the Princeville community. Spectacular mountains views can be found all around the home and even a peek-a-boo ocean view! This is a very close walk the St. Regis Resort and Beach. This luxurious 3Bd/3Ba resort condominium with spectacular views is located along the 12th fairway of the Waikoloa Beach Golf Course and is exclusive only to residents and guests. Perfectly situated on a half mile long white sandy beach with direct beach access and conveniently located on Kauai's northern and easterly shores is Anahola Beach House. If you’re looking for the perfect home in paradise, you’ve found it! 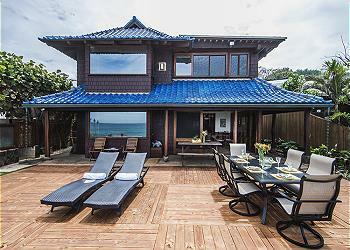 Discover Ka Hale Olu at Anini Beach, a North Shore Kauai vacation rental. With 3 bedrooms plus loft, and the beach right across the street, you'll experience a true Hawaii vacation. Located in the enchanting community of Puako Beach, Hale La'i is the ideal place for a family getaway or gathering of friends. This 4BD/3BA 2 story home is located directly across the street from a beach with gorgeous marine life filled tidepools. Just across the street from the iconic Hanalei Bay with its ocean and mountain views is this large family home perfect for your Kauai vacation!